Supports large or small animals coping with stress from illness, performance or travel. Promotes restored health and wellness. Supports improved joint health and flexibility, increased energy, healthier coat, stronger bones and improved immune strength. 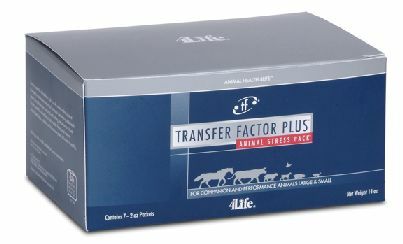 4Life Transfer Factor Plus Animal Stress Pack is an all-animal wellness product recommended and developed by veterinarians and nutritional scientists for animals with compromised immune systems and stress-induced conditions. It addresses the acute situation, whether associated with illness, performance or travel. It includes high levels of select vitamins and minerals, electrolytes and probiotics, along with the 4Life® Transfer Factor Plus® Advanced Formula to get your animal on the road to recovery and maximum health. This formula addresses the acute situation, whether associated with illness, performance, or travel. It includes high levels of select vitamins and minerals, electrolytes, and probiotics. 4Life Transfer Factor Advanced Formula: Transfer Factor E-XF (a patented concentrate of transfer factors and other natural components from cow colostrum and egg sources), Thymupro-Thymus Complex, Cordyvant Polysaccharide Complex, (IP-6, Soya Bean extract, Cordyceps Sinensis, Beta-Glucans, Mannans Agaricus Blazeii, Maitake Mushroom, Shiitake Mushroom) Zinc, Vitamin A, Vitamin D3, Vitamin E, Vitamin B1, Vitamin B2, Vitamin B12, Dipotassium phosphate, Potassium Chloride, Magnesium Sulfate, Calcium Pantothenate, Ascorbic Acid, and Lactic Acid Bacteria. "The owners of a pregnant mare sent her for training from California to Reno. After she was there for about three weeks, she got a high fever and was really sick. The owner got pretty nervous about that and called me; I recommended that we use the Animal Stress Pack. In four days, she had bounced back and was back to her training." "We had a litter of eight-week-old kittens. One came to the door one evening looking quite sick. I immediately prepared a bit of 4Life Transfer Factor Plus Animal Stress Pack and squirted it down the kitten’s throat. The next morning the kitten looked much better. We gave it Stress Pack at regular intervals throughout the day and it started to drink water and walk. Within two or three days, it was running around, almost tripping us, eating food, washing itself. We were truly amazed."